As a parent, you’ll be short on both time and patience. So why not invest in a crib mattress that will last from infancy right through to the early toddler stages.Colgate’s dual-sided crib mattress features a firm side for babies with a softer side for when your child grows up. Babies need firm support to help them develop the muscles they need to support themselves. Once they reach a toddler’s age, they’ll want a softer surface which provides more comfort. 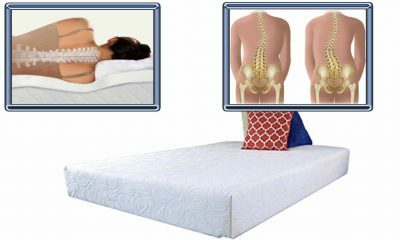 Using a dual-sided orthopaedic mattress, like this one, will help develop good posture from a young age. The environmentally friendly materials used in production are a standout feature of Colgate mattresses which guarantee your little one will be breathing natural air without toxins or chemicals. So, without further ado, let’s run through a few of the key features of the Colgate Eco Classica dual-sided crib mattress. Interested to know why this crib mattress scored the highest in 2019? 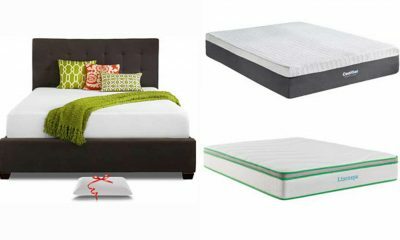 Then, don’t forget to check our full list of the top rated crib mattresses. The outer cover is the part of the colgate crib mattress that will be closest to your baby’s skin. 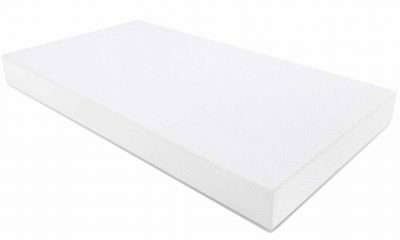 This crib mattress is finished with an organic cotton breathable layer. These natural materials reduce the likelihood of rashes whilst the breathable fabric prevents your child from getting too hot during the night. 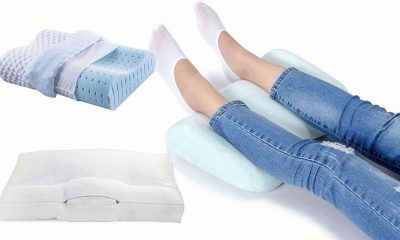 As much as we want breathability, there are practical aspects we simply need in a mattress. Having a waterproof cover, for example, is essential to ensuring the inner mattress remains free from damp. The cotton cover on this colgate mattress is lined with a waterproof fabric to ensure that no moisture seeps into the layers below. This Colgate crib mattress is built using a layered system to provide maximum versatility. On one side there is thick plant-based oil Eco foam. This layer is designed to provide maximum support during the early stages, helping to develop muscular independence whilst reducing the likelihood of SIDS. 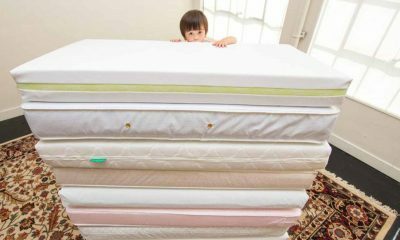 Flipping the mattress treats toddlers to a softer side. Made from the same oil-based Eco foam this side is slightly less dense. 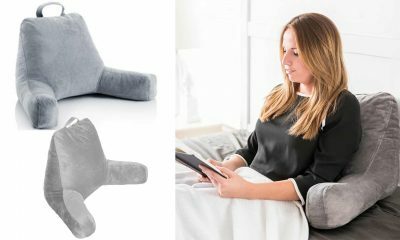 That makes for a more comfortable sleeping surface which lets toddlers sink in whilst still providing good levels of support to their back and spine. 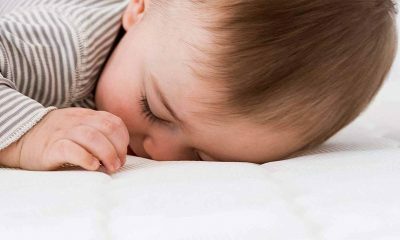 Flame retardants might reduce the risk of fire but they also release harmful toxins and chemicals when consistently rubbed or put under pressure; in other words, when a baby sleeps on it regularly. The final aspect of this mattress is a dense cotton anti-flammable layer which keeps your baby safe from harm. The material construction of this Colgate is natural and holds a Greenguard certificate which means it has passed a strict set of tests for low chemical and toxic emissions. There’s no trial period available with this colgate crib mattress although you will have up to 30 days to return it if you find it unsatisfactory through the US consumer rights act. 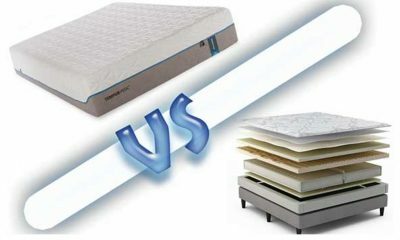 The mattress is a firm one so you might want to factor that into your decision when buying. For some children it will be too firm and result in sleepless nights although, after a bedding-in period it will work wonders for their posture and muscular development. There’s a lifetime warranty offered with all Colgate products although it’s a conditional warranty. That means you aren’t covered for stains, tears or other signs of usage. Physical abuse of the product such as bending it or pulling out layers won’t be covered either. What is covered under warranty is manufacturing quality and defects. If the Colgate loses its shape or arrives in poor condition then you can enact your warranty. Be advised that you will have to cover all the shipping costs yourself. 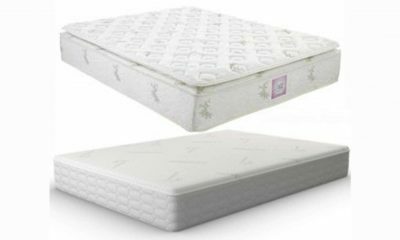 Buying through Amazon will allow you to ship this Colgate Eco Classica III crib mattress anywhere in the US. They also provide free returns should you find the product unsatisfactory. If you’re based outside of the US you won’t be able to get this product shipped from Amazon but may have some luck going directly to the manufacturer. 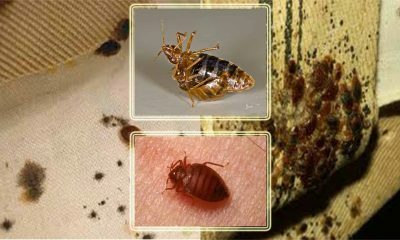 Choosing a natural mattress does come at a price. Natural materials are more expensive to produce than materials made using toxins and chemicals. 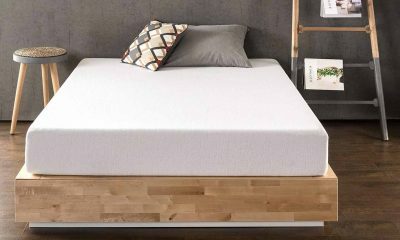 This is a mid-range mattress overall, but a low-cost natural mattress. The size has been designed to accommodate all standard US cribs. It passes the ‘two finger depth’ edge test and makes for a snug fit. There’s no risk of a child slipping into the gaps although the square corners will mean you need to buy specialist sheets to fit it. We were surprised by just how firm this mattress is. With a 6” thickness we had expected something that was plusher. On the baby’s side it’s stiff as a board which helps to reduce the risk of SIDS and will help with your child’s muscular development. Flipping it onto the toddler’s side we found that the Colgate Eco-Classica III remained surprisingly firm. There really isn’t too much difference between the two sides and we feel it will be too firm for some toddlers. 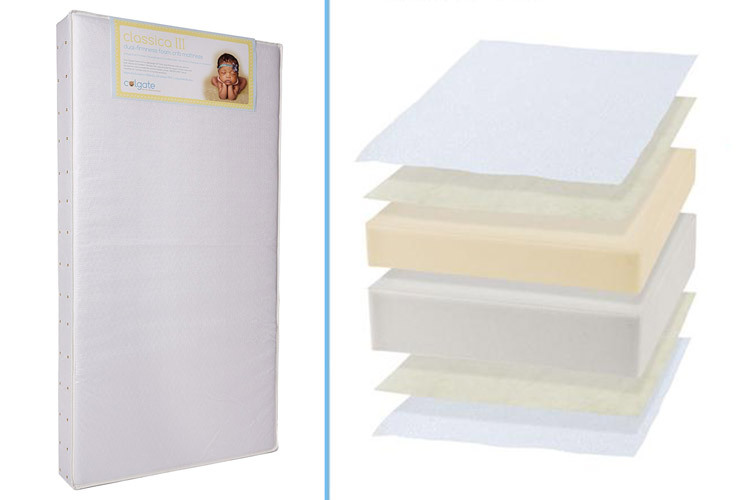 Be sure to check out our top-rated breathable crib mattress to get rid of SIDS. 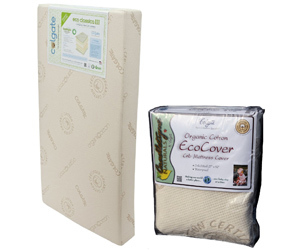 The Colgate Eco Classica III crib mattress uses a square corner design which is becoming an industry standard. Parents prefer square corners because they fit snug into the corners of the crib. 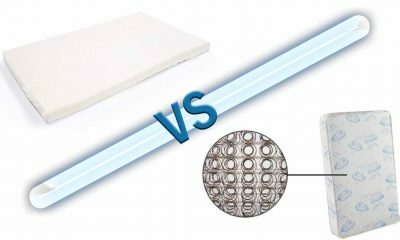 One of the biggest issues with opting for a foam crib mattress is edge support. The properties of foam mean that, although you get a better overall support, the edges tend to be more malleable. Fitting this into a US standard crib we found the fit to be suitably snug. We couldn’t fit more than two fingers down the side so we felt satisfied that there was no risk of the edges collapsing under a baby’s weight. Once your infant reaches toddler’s age, those soft edges might become a bit more of a problem. We can’t see it ever being dangerous, but there isn’t as much edge support as we’d like. You Might Want To Avoid This Mattress If! 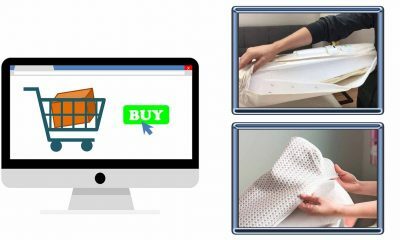 If you’ve come to this page looking for an all-natural mattress then you will have to continue your search. This Colgate Eco-Classica III crib mattress uses plant-based oil to enhance memory foam but it still uses polyurethane in construction. 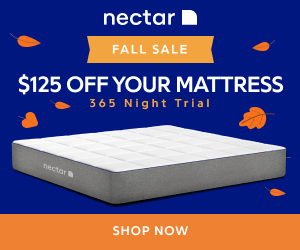 At this price, you’ll be hard pushed to find a 100% natural mattress. If that’s a deal-breaker for you then you’ll have to adjust your budget accordingly. 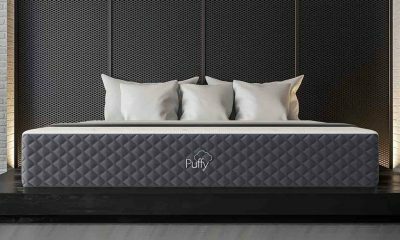 As it stands this mattress has exceptionally low emissions for chemicals and toxins but there are synthetic grade materials used in construction. What Makes This Mattress Stand-out? The highlights for us were the firmness and the dual-sided feature. It’s a mattress that is built for longer than just the first 18 months of a baby’s life which makes it good value. 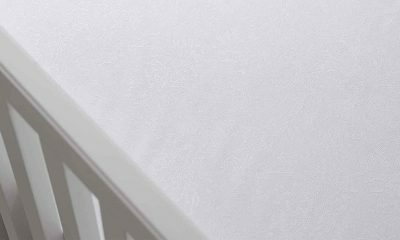 The firm texture will encourage development, reduce the chances of SIDS and has a softer, more comfortable side for toddlers. We were also impressed by the safety features. A Greenguard gold award is not handed out to every mattress on the market and guarantees low toxic and chemical emissions. Organic cottons will be excellent for babies with sensitive skin and it fits snug into a US standard crib. For under $200 you can’t expect better quality or materials than the ones featured here. How Long Will This Colgate Crib Mattress Last? This Colgate Eco-Classica III mattress has been designed for early years. That should be, at most, 4 years before you’re ready to move your child into their own bed. The manufacture seems flawless in terms of stitching and is backed up by the lifetime warranty. There are a few issues that we can see being a problem with long-term usage. Our main concern is with the cover which does pick up stains over time. 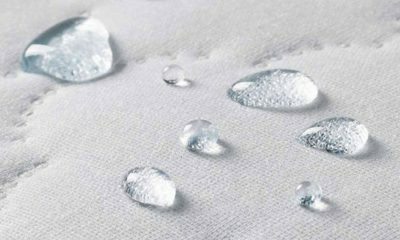 If you really want to make the most of this for its full lifespan, we’d recommend investing in an extra mattress protector. Foam products will naturally soften up with time and usage. The foam used here is dense and firm which gives us confidence that it won’t get too soft even after several years usage. 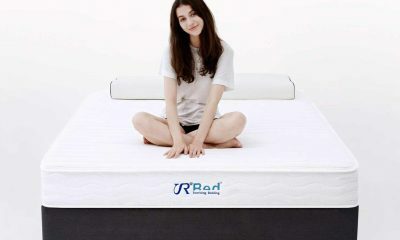 There’s also no risk of sagging in the mattress itself, although the cotton cover will be susceptible to wear and tear. Parents that are looking for a safe crib mattress which will last for as long as their child sleeps in a crib need look no further. The material construction is excellent, there’s no noticeable smell or release of toxins. 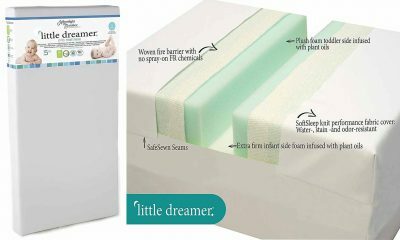 Suitable for both infants and early-stage toddlers this dual-sided mattress should be the only purchase you’ll need to make. When we review these products we tend to look at the brand, materials and features. Understanding how well this mattress performs on a daily basis requires a different type of expertise. For that, we research confirmed customer reviews to tell you what regular parents are saying. Based on confirmed customer reviews the good news is that this Colgate Eco-Classica III has no toxic smell. Parents also confirmed that the organic cotton layer is exceptionally comfortable and felt safe with their infants sleeping on it. They also appreciated the light-weight nature of this crib mattress which made it particularly easy to change sheets or flip. The sticking point with this Colgate Eco-Classica III was the firmness. Parents couldn’t tell the difference between the two sides and felt that the toddler side was far too firm to offer a comfortable night’s sleep. Colgate is a family run business which has been in the industry since 1955. You don’t last that long without making happy customers and a big reason for that is their understanding customer service team. The company is US based which is always helpful if you need to contact the manufacturer. Based in Atlanta you can contact them by phone, email or post and response rates are quick. Enacting a warranty claim is very straight-forward although we were a little disappointed by the lack of a trial period. The biggest complaint we’ve seen registered with this company is the claims that it is an eco-friendly mattress. Unfortunately, to be classified as a natural mattress the product only has to contain 5% of natural materials. This is not Colgate’s fault but a problem with the industry as a whole. This mattress, for example, is made from 92% polyurethane. 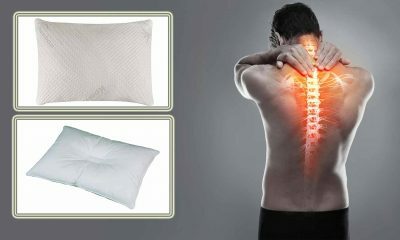 If a fully biodegradable, 100% natural mattress is what you’re looking for then you will be disappointed with this one. The organic cotton covering is only featured on one side whilst the toddler’s side is just too firm to provide a comfortable sleep. This Mattress Isn’t 100 percent Natural, So How Toxic Is It? When we talk about chemicals and toxins we’re talking about how they’re released more than whether or not they are present. 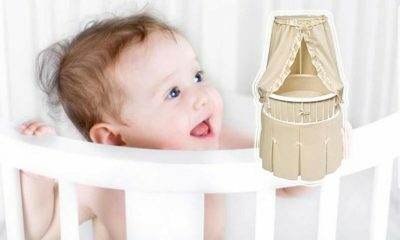 This Colgate Eco-Classica III crib has a Greenguard gold certificate. That means it has extremely low levels of chemical emissions which is evidenced by the lack of a scent when you take this mattress out of the packaging. There’s also very little chemicals used in the production of this mattress and it has passed all US safety regulations as of 2017. In short, it’s an exceptionally safe mattress that uses some natural materials in construction. Will This Fit In My Crib? So long as your crib conforms to the US standard sizing then there should be no problem fitting this mattress to it. We found that it fit flush with our crib without any gaps or crevices. Does It Work On Convertible Cribs? Although the Colgate Eco-Classica III is certainly flexible, we did find the thickness was a problem. Other than that, this mattress is dual-sided which means it should, in theory, be suitable for convertible cribs provided you can squeeze it in. Is This A Dual-sided Mattress? Yes. The Colgate Eco-Classica III crib mattress features a firmer side for infants and a softer side for toddlers. The problem we had with this mattress was that the toddler side did feel a little uncomfortable for our liking due to its firmness. Will Cleaning Be A Problem? The cover that this mattress comes with is waterproof. Unfortunately, it’s not stain-proof. The organic cotton upper layer also makes it more difficult to machine wash which will wear the cotton away. 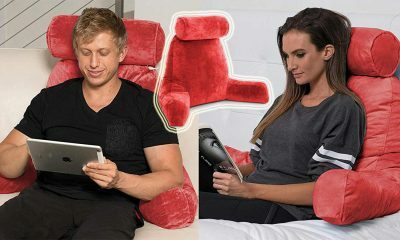 If you’re going to invest in this product, we’d recommend buying a separate cover to go with it that is machine washable, stain-proof and water resistant. Is there a Warranty With Colgate products? Colgate products come with a conditional lifetime warranty. In simple terms, you can enact the warranty if there is a manufacturing defect or the product is not as has been described. The warranty won’t cover you for wear-and-tear issues or for defects that occur from improper usage. Can I Return It Easily? If you’re purchasing from Amazon you can use Amazon’s return policy. That offers free postage alongside a 30-day purchaser’s guarantee. If you’re looking to return it directly to the manufacturer you will have to pay the shipping costs yourself. Fortunately, this is a US-based company so it won’t cost too much to have a product shipped.